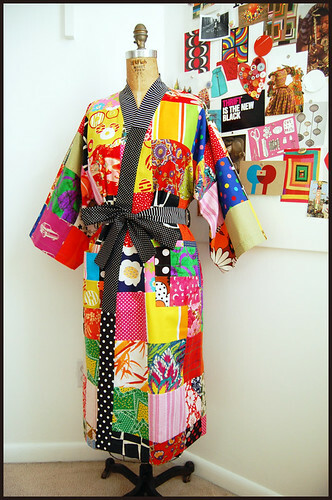 anyhow, this here's a fairly simple kimono style robe. the pattern is from the 1970s, this pattern to be exact. fabric is patchwork i made myself, from various and sundry scraps i had in my scrap fabric stash. 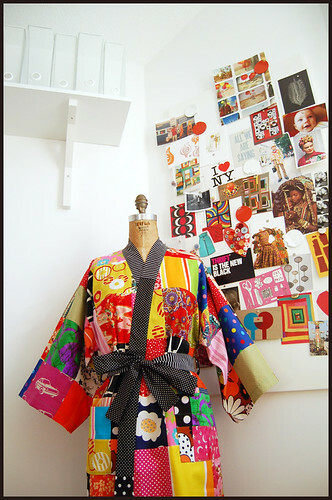 it's a pretty equal mix of vintage and new fabrics. the edging and belt are made from newly acquired bits of fabric, as is the unseen solid red-orange lining. the impetus? most ready-to-wear robes are abysmal, and lack personality (perhaps i've been looking in the wrong places? hah!). anyway, i never could find a fun (or sturdy!) robe in the usual mass market retail venues, and haven't found a thrifted robe that's up to my own quirky, personal snuff. so i felt i had to take matters into my own hands, as it were. i wanted something really 70s and fun...i think i succeeded.